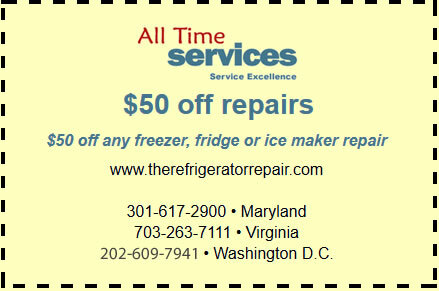 CALL US NOW IF YOU ARE HAVING ISSUES WITH YOUR SUB-ZERO REFRIGERATOR! We are open 24/7. Are you tired of worrying about that funny noise your Sub–Zero refrigerator is making? Does the condensation on the door seem to be getting worse? Does the compressor seem to run constantly without cycling off? These are all very real problems and can be symptoms of issues with specific parts on the verge of failure. For that reason, it’s important you call a Sub–Zero refrigerator repair expert to inspect and repair your fridge as soon as possible. 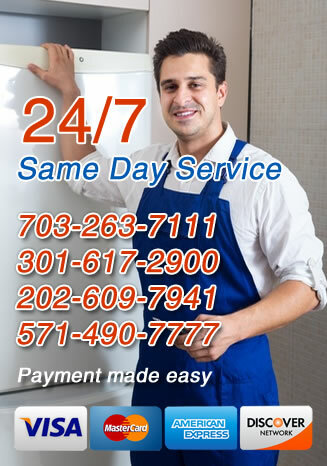 For quick and expert repairs in Virginia, Maryland, DC, Arlington, Gaithersburg and the greater Washington D.C. area, call All Time Services today. Ice Maker – An ice maker is a complex piece of machinery. A single piece could be out of alignment or broken or the plumbing itself might need service. Freezer Compartment – Excess frost, icing or broken defrost timer settings can all be problems in your freezer compartment. Leaks – A leak might be due to a number of problems, ranging from a leaky drip pan to a broken ice maker or a problem with the evaporator coil. Thermostat – A busted thermostat usually manifests in frozen food in your refrigerator. Motor – A motor problem may result in inefficient cooling, or the refrigerator simply not working at all. Compressor – A broken compressor can cause your Sub–Zero refrigerator to stop working completely or result in a loss of cooling capacity. Door – If your door spacers or gaskets are missing or broken, the fridge won’t seal properly and will run longer and harder causing a number of potential problems. Whether you simply suspect a problem building or your Sub–Zero fridge has completely broken down, you need to call for service right away. We will schedule a consultation and repair visit as soon as possible to take care of whatever issues are plaguing your refrigerator.